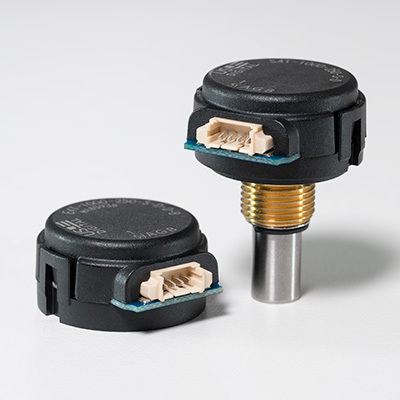 We've got some great news about our smallest encoders. The E4T and S4T miniature optical encoders are now available at even higher resolutions than before! With two new CPRs of 512 and 1000, we've successfully doubled the resolution while keeping the housing unchanged. Utilizing state-of-the-art transmissive optical sensing technology, these newly announced resolutions now support applications requiring up to 4000 pulses per revolution. This substantial increase in resolution was achieved without any compromise to package form factor, electrical characteristics or output signal robustness. The E4T line of encoders is available in both single-ended and differential signal outputs for applications where noise immunity is critical. Moreover, the 512 and 1000 CPR options retain the E4T's simple and efficient, push-on hub disk assembly process, helping US Digital customers keep installation time, assembly cost and complexity to a minimum. 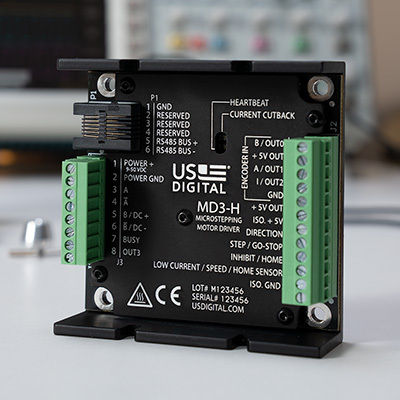 Vancouver, Washington, USA, August 6, 2018 – US Digital, a U.S. manufacturer of motion control products since 1980, announces the release of the MD3 Programmable Microstepping Motor Driver. It is capable of driving motors from NEMA size 14 to 42. The MD3 accepts 9-50VDC power inputs and rated for currents up to 7A continuous duty. In addition to digital input controls, the MD3 can be configured and controlled using the open MODBUS RTU protocol over an RS485 bus. A supplied GUI application allows change to many settings including the number of microsteps per full step, acceleration/deceleration rates, speed, and current cutback. For more information visit usdigital.com/md3. Introducing PayLink from Nodus Technologies, Inc.. PayLink is a fast, secure, and convenient way for US Digital customers to make credit card payments 24 hours a day, seven days a week from anywhere! With a one-click link to review invoice details and make payments, the PayLink process is fast and easy. There's no need to log into a website, a payment portal, or retype financial information with every online payment. You can store these details for future use within a private and secure environment. Please note: With this new service – as of May 21, 2018 – US Digital will be transitioning away from accepting fax order forms. Questions? Please feel free to contact the customer support team at sales@usdigital.com or call (360) 260-2468.